Information One of our newest library branches is located in the Westville Municipal Building on Queen Street (the old elementary school), next to the Fire & Police station. 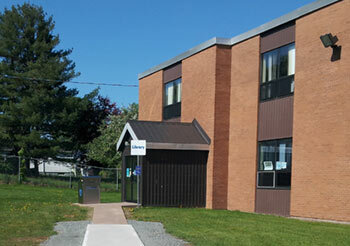 The Westville Library is a wireless hotspot (WIFI) with access to high speed Internet. Programming, Reader's advisory, reference, inter-library loan, Internet access, public computer workstations, a laptop, scanner, photocopier, printer, 3D printer, GPS, family play packs, Nordic walking poles, and a Public Art Display Cabinent. Instructional tours available upon request. Instructional tours available upon request. A 24-hour bookdrop is available at the Library entrance. Facility Rental: The library's Community Room is available at a cost of $25 for a half day and $50 for the full day, and there is no cost for non-profit organizations. The Community Room is fully equipped with a TV, DVD, lectern, OHP screen, projector, computer hook up, and you can also wheel in a PC from the Tech area. A small office is also available for reservations.